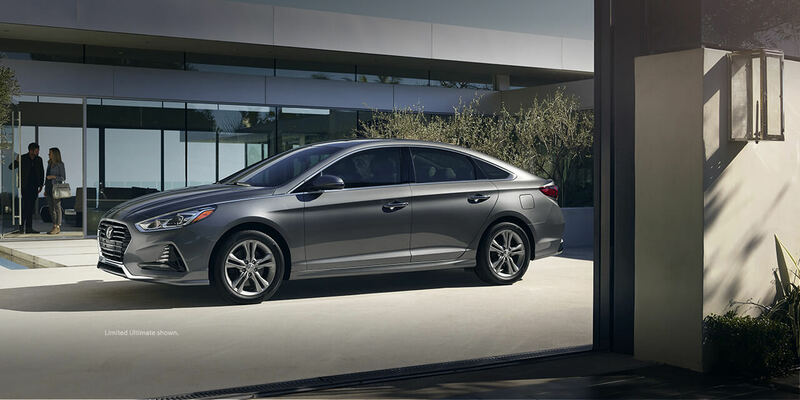 Milton Hyundai > Hyundai Sonata > The 2018 Hyundai Sonata: Refreshed and Ready to… Excite! The 2018 Hyundai Sonata: Refreshed and Ready to… Excite! For 2018, Hyundai gave the Sonata a makeover that makes you look twice when you see it for the first time. When you look at it head-on, the new grille is broad and is designed to resemble steel being poured from a ladle and emphasises the strength of this mid-sized passenger car. The front headlights have been reshaped and are offered with full LED lights in the higher-end models. LED daylight strips give the front an aggressive appearance. The front grilles on some of the trim packages are mesh rather than solid bars. In addition, all trim lines got a new hood. Hyundai also made some significant changes to the rear of the car. It has a sportier rear end and is equipped with a new trunk lid and LED taillights. A single exhaust has replaced the previous quad exhaust. The license plate has been moved to the bumper. There is little change to the profile of the 2018 Sonata, but there are three wheel sizes across the seven models packages to choose from. Hyundai didn’t stop with the exterior; they made sitting behind the wheel comfortable and put everything within reach. The steering wheel has been replaced with a three-spoke steering wheel capable of multi-functions, so you never have to take your hands off the wheel. The Sport model has a leather wrapped D-cut wheel with paddle shifters. That pairs nicely with the Sport mode, the 2.0L Turbo GDI and the 8-speed automatic that comes in the Sport 2.0T model. The driver’s seat comes equipped with an Integrated Memory System (IMS) that remembers both the seat and the mirror positions that you prefer. A touch of a button puts you right where you are most comfortable when behind the wheel. The touchscreen has been trimmed in silver to match the new silver buttons that Hyundai changed out from black on the 7-inch infotainment centre. The technology on the dash has been updated to ensure that your Android Auto and Apple CarPlay integration goes as planned, and Hyundai’s Blue Link System can now talk to Amazon Echo. With that feature, you can talk to your house from your car. There is a second row of USB charge ports in the back seat for your rear passengers to charge up, and your front seat passenger can recharge their smartphone by using the Qi wireless pad. A hands-free Smart Trunk lets you effortlessly open your trunk even if your hands are full. As with other Hyundais, numerous safety features are standard and some of the more advanced ones are available on higher-end models. Blind Spot Detection with Rear Cross Traffic Alert and Lane Change Assist are standard features on every model. As you move up in models, the safety equipment becomes more sophisticated like the Dynamic Bending Lights and the LED headlights that are available in the Limited model. There is a difference between the front and the rear of the 2017 Sonata and the 2018 Sonata, so you need to compare them side by side in order to fully appreciate the latest changes to the style. It doesn’t matter which one of them you prefer, both make excellent passenger vehicles for work and play. Stop by and see us today to test drive the 2018 Hyundai Sonata.